Camden Town. If you’ve been there you’ll know its a whole new world of crazy! Clothes, food, stalls, and everything in between! What I love about camden town is people watching – everyone has such a unique style! It’s brilliant! Whilst we were venturing our way around the markets in Camden, I came across BIRD. 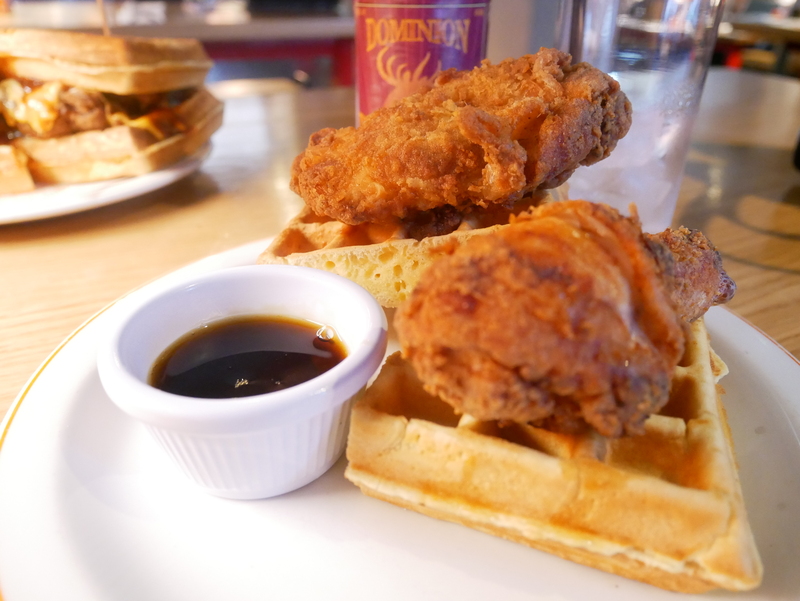 I have been meaning to go here to try out their chicken and waffles, but never made it. I had to try it while I was here. It had been a full day of eating so I didn’t manage to eat much. 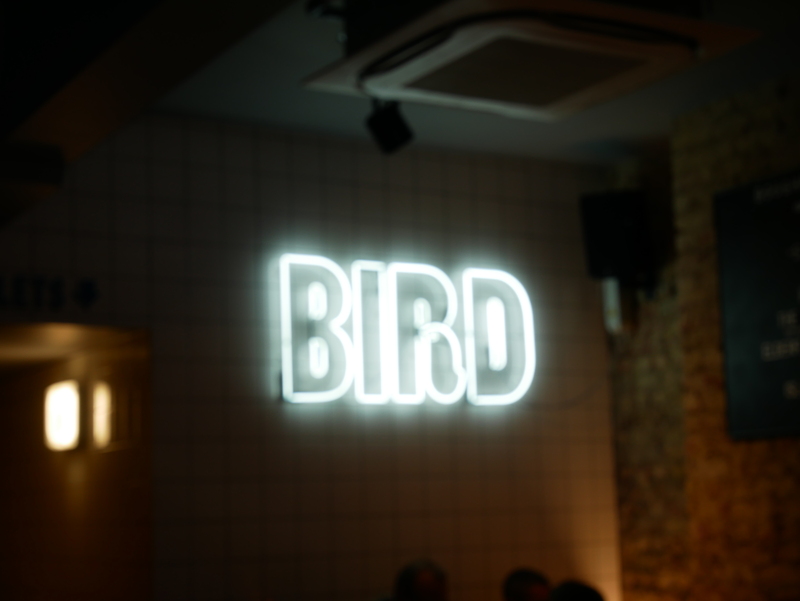 BIRD has a very minimalistic yet effective interior. 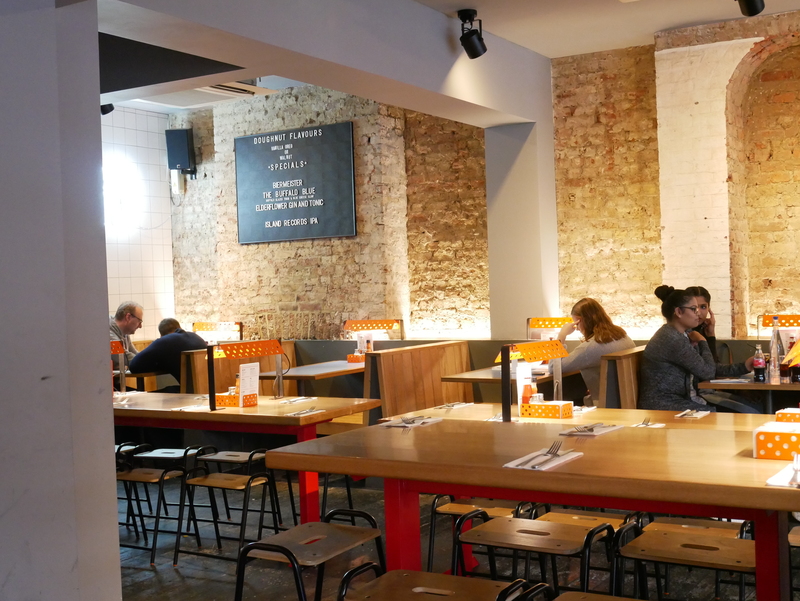 Keeping in line with their orange theme, BIRD has a good capacity in the restaurant. My friend ordered the chicken and waffles and I decided to try out the Waffle Burger. When I came into the restaurant I asked about the halal status, and was told everything was halal. So it was safe to presume that the bacon in the waffle burger was halal too right? Wrong! It certainly is not, make sure you specify that you want the burger without the bacon!! 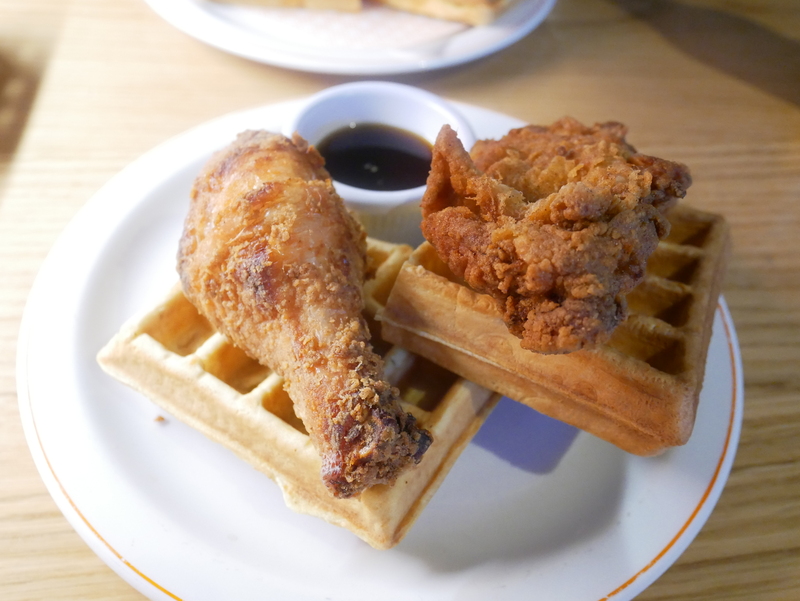 Chicken waffles – i first had them at Stax in my pre blogger days. Initially I thought it was a weird concept, I mean who puts maple syrup on chicken?? Once I got over the initial shock, it was great. 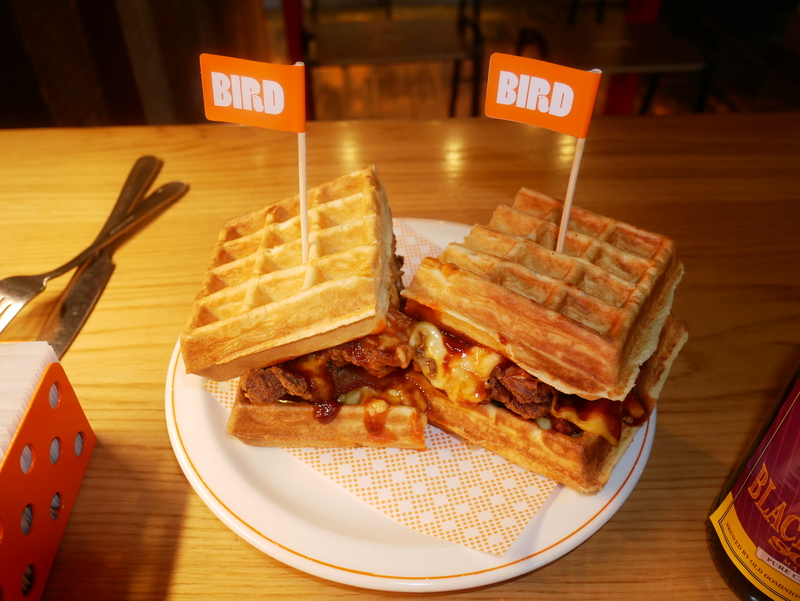 The waffles were small-medium sized at BIRD, and were enough for just a leg piece of chicken. The chicken was lovely, it was moist, it was soft to cut into, and above all, it was flavoursome. The waffles were okay, but not great. They felt a bit raw, out of a packet kind of waffles and were rather quite standard. I much preferred the waffles at Ma’Plucker. 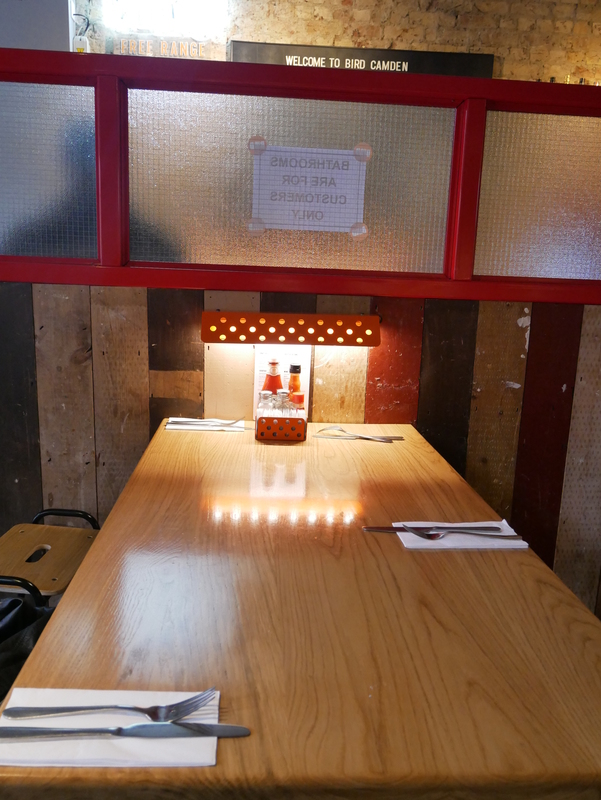 The waffle burger – or burgers I should say! I wasn’t expecting 2!! Having said that the waffles were quite small so 2 wasn’t a huge amount… If I hadn’t eaten half of London at this point that is! The cheese covered chicken was good but wasn’t really convinced on the waffle burger as a whole. Because the waffle was a bit limp, it couldn’t hold the weight of the chicken and cracked under pressure, literally! Some of the chicken was also a little too fatty to bite through. It was alot though, even though the “burgers” were small in size, they were wholesome and I struggled towards the end! 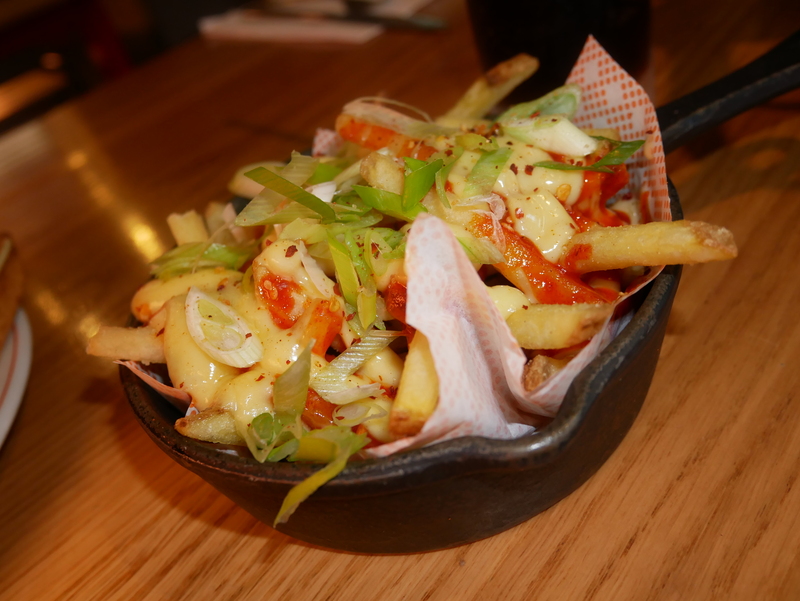 I also ordered the Cheesy Korean Fries..
Fried covered in American cheese sauce, house mayo and gochujang glaze. A rookie error on my part, the mixture of the tastes really did not sit too well with me. So, I could only have a handful (if that!) They were very heavy and not in a good way. 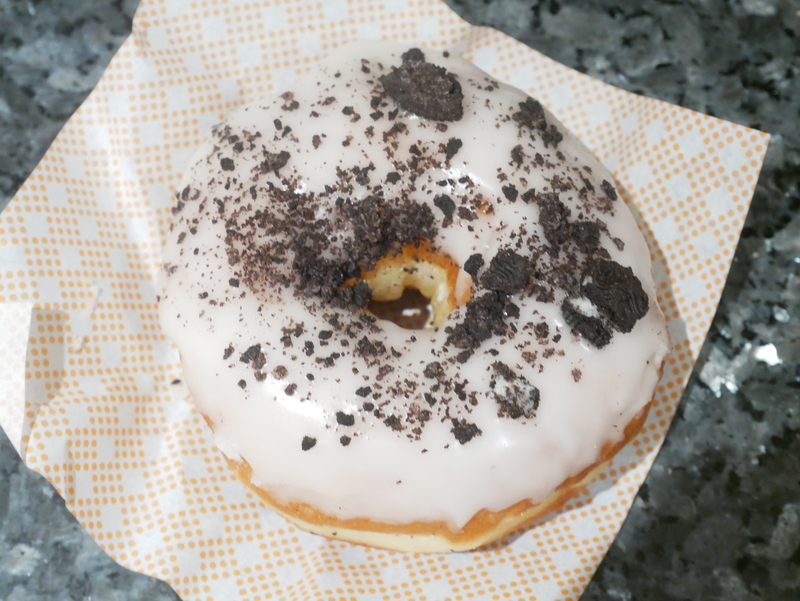 I was also given a huge doughnut to take away.. It was huge! But so yum! Something you would find on Brighton Pier, so fresh and sugary! Loved it. Overall, I thought the food was good but not amazing. Their motto is “the best fried chicken you’ve ever tastes”? – probably not but it definitely easn’t the worst either! The waffles were a bit of a let down for me. The service, although not bad, felt rather slow even though there wasn’t many people in the restaurant when we were there, although it was a Sunday evening! Although the manager did apologise as they were short staffed. Overall the service was good, they were helpful and informative in a casual way. Overall, giving BIRD a total TLH score of 5 out of 10. Halal Status: Only their chicken is halal, but they also serve bacon so be sure you ask the waiter whether it is contamination free.